Lying my hands out on the fluffy white towel in front of the nail technician, my indecisive nature kicks in, what colour do I want my nails? I’m trying out Shellac, I picked a red hot at first, but like a magpie I quickly spot the technician’s glittery gold nails and think WOW! 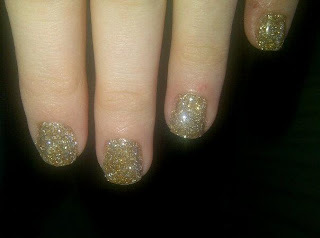 So I change my mind and pick the gold glitter Shellac, the perfect balance of tacky and fabulous! Kirsty, the technician cleaned the nail of any previous polish and shapes your natural nails, a UV base coat is applied to the natural nail and just like gels and your hands go under the UV lamp for 10 seconds. “With gels we need to buff away the rough top layers of the nail before we start, but with Shellac, all we do is shape the nail and remove the cuticles. It causes no damage to the nails unlike gels, which is part of the reason the treatment is becoming so popular. 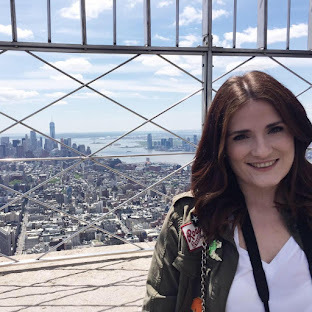 I’ve done more Shellac treatments than I have polish and gel combined since October when I introduced the treatment to Beautique” says Kirsty Hughes, owner and nail technician at Beautique – Beauty Rooms. So what are the downsides to this new chip free colour treatment? “At the moment Shellac only has 30 colours, none of which are matte. The good thing is that you can layer the colours together and create new ones and also they have glitter and shimmer top coats and of course the Shellac Rockstar which I’m applying for you,” Kirsty tells me. So the final layer is applied and the sticky residue on the top of the Shellac is rubbed away and voila! I left Beautique with a huge grin, I love my new gold glittery nails! Although I love the high street ideas of nail art, you can’t beat a good old natter with the technician and it feels like you’ve had a treat and been pampered, try it out! @Natalie - They cost £28 in my beauty salon. You can go back to the salon to get them removed but I just bought acetone and soaked the shellac off myself. My nails were dry afterwards but nothing cuticle oil and some hand cream couldn't fix. It's best to get shellac done by a professional then you are sure that it's applied properly.